Former captain Alastair Cook, pictured in 2016, holds several England Test cricket records. Sir Alastair Nathan Cook, is an English cricketer who plays for Essex County Cricket Club, and formerly for England in all international formats. A former captain of the England Test and One-Day International (ODI) teams, he holds a number of English and international records. He is regarded as one of the greatest batsmen ever to play for England, and is one of the most prolific batsmen of the modern era. Cook is the fifth highest Test run scorer of all time. In the sport of cricket, a century is a score of 100 or more runs in a single innings by a batsman. The term is also included in "century partnership" which occurs when two batsmen add 100 runs to the team total when they are batting together. A century is regarded as a landmark score for batsmen and a player's number of centuries is generally recorded in his career statistics. Scoring a century is loosely equivalent in merit to a bowler taking five wickets in an innings, and is commonly referred to as a ton or hundred. Scores of more than 200 runs are still statistically counted as a century, although these scores are referred as double, triple, and quadruple centuries, and so on. In the sport of cricket, a slip fielder is placed behind the batsman on the off side of the field. They are placed with the aim of catching an edged ball which is beyond the wicket-keeper's reach. Many teams employ two or three slips. A floating slip is sometimes employed, usually in limited over games, who patrols an area in the slip cordon that would ordinarily be occupied by more than one fielder. The slip cordon's distance from the batsman increases with the pace of the bowler; generally they will be marginally further away from the batsman than the wicket-keeper is. Because of the resulting geometry, spin bowlers generally have fewer slips in the cordon than a fast bowler would in an equivalent game situation. As fielding in the slips requires quick reflexes and sure hands, usually the most adept catchers in the team will make up the slip cordon. Most slip fielders are top order batsmen. Specialist slip fielders are sometimes called "slippers". James Michael 'Jimmy'Anderson, is an English international cricketer who plays for Lancashire and England. Regarded by some as one of the greatest fast bowlers of all time, Anderson is the all-time leading wicket-taker among fast bowlers and holds the record of most wickets for England in both Test and One-Day International (ODI) cricket. He is the only English bowler, and the 6th overall, to pass 500 Test wickets. In cricket, a five-wicket haul refers to a bowler taking five or more wickets in a single innings. This is regarded by the critics as a notable achievement. As of 2018, only seven cricketers have taken a five-wicket haul in all three international formats of the game : Sri Lankans Ajantha Mendis and Lasith Malinga, Indians Bhuvneshwar Kumar and Kuldeep Yadav, New Zealander Tim Southee, South African Imran Tahir and Pakistani Umar Gul. In 2018, Afghan cricketer Mujeeb Zadran, aged 16, became the youngest bowler to take a five-wicket haul in an ODI. Sri Lankan Muttiah Muralitharan has taken the most five-wicket hauls in Test matches with 67, and Pakistani Waqar Younis has taken the most five-wicket hauls in ODIs with 13. The record for most five-wicket hauls in T20Is is two, shared by three cricketers: South African Imran Tahir, Sri Lankan Ajantha Mendis, and Pakistani Umar Gul. The top five records are listed for each category, except for the team wins, losses and draws and the partnership records. Tied records for fifth place are also included. Explanations of the general symbols and cricketing terms used in the list are given below. Specific details are provided in each category where appropriate. All records include matches played for England only, and are correct as of February 2019 [update] . The England cricket team represents England and Wales in international cricket. 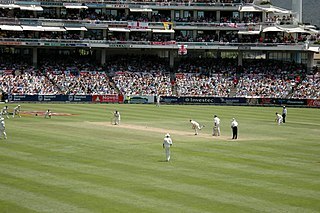 Since 1997 it has been governed by the England and Wales Cricket Board (ECB), having been previously governed by Marylebone Cricket Club from 1903 until the end of 1996. England, as a founding nation, is a full member of the International Cricket Council (ICC) with Test, One Day International (ODI) and Twenty20 International (T20I) status. Until the 1990s, Scottish and Irish players also played for England as those countries were not yet ICC members in their own right. 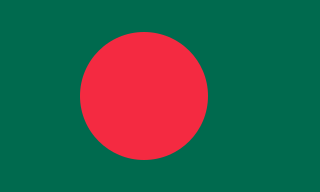 The Bangladesh national cricket team, is administered by the Bangladesh Cricket Board (BCB). Bangladesh is a full member of the International Cricket Council (ICC) with Test and One Day International (ODI) status. It played its first Test match in November 2000 against India in Dhaka, becoming the tenth Test-playing nation. The Indian cricket team toured Sri Lanka in August 1997, participating in two Test matches and three One Day International (ODI) matches. During the first Test match, Sri Lanka scored 952 runs for 6 wickets, the highest team total in Test cricket. Several more records were established in this match, including the highest partnership for the second wicket by Sanath Jayasuriya and Roshan Mahanama. The Test series ended without a result, with both Test matches drawn. R. Premadasa International Cricket Stadium(RPS) is a cricket stadium on Khettarama Road, Maligawatta, Colombo, Sri Lanka. The stadium was, before June 1994, known as the Khettarama Cricket Stadium and is today one of the main venues where the Sri Lankan cricket team play, having hosted more than 100 one day international matches. 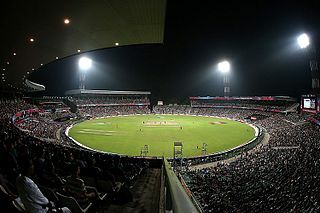 It is the largest stadium in Sri Lanka with capacity of 35,000 spectators.It has hosted the 2012 ICC World Twenty20 finals between Sri Lanka and West Indies, 2002 ICC Champions Trophy finals between Sri Lanka and India and first semi final of the 2011 ICC Cricket World Cup between Sri Lanka and New Zealand. Also this is the venue where the highest Test score in the history was recorded; 952 by Sri Lanka against India. It has capacity exceeding Lord's Cricket Ground. It is nicknamed "Home of Sri Lankan cricket". In 1938, Wally Hammond led England to victory over Australia by an innings and 579 runs, the greatest winning margin by an innings in Test cricket. Michael Vaughan led England to victory over Australia in the second Test of the 2005 Ashes series by a margin of two runs. Archie MacLaren led the English team that lost the fourth Test of the 1902 Ashes series by a margin of three runs and won the fifth Test by a margin of one wicket. Both records still stand over a century later as England's narrowest win by wickets and narrowest loss by runs, respectively. Pelham Warner was the captain of the English team that lost the first Test against South Africa in January 1906 by a margin of one wicket, the narrowest loss for England by wickets. Len Hutton has scored the highest individual Test score (364) for England. Herbert Sutcliffe has the highest career batting average for England with 60.73. A half-century is a score of between 50 and 99 runs. Statistically, once a batsman's score reaches 100, it is no longer considered a half-century but a century. A century is a score of 100 or more runs in a single innings. Wally Hammond has scored the most double centuries for England with seven and holds the England record for the most runs scored in a series with 905 runs during the 1928–29 Ashes series. A double century is a score of 200 or more runs in a single innings. A triple century is a score of 300 or more runs in a single innings. 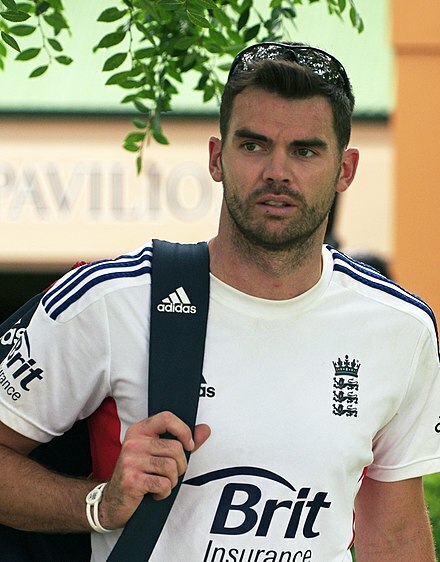 James Anderson holds the record for the most wickets taken by a fast bowler in Test cricket with 575. A bowler takes the wicket of a batsman when the form of dismissal is bowled, caught, leg before wicket, stumped or hit wicket. If the batsman is dismissed by run out, obstructing the field, handling the ball, hitting the ball twice or timed out the bowler does not receive credit. A bowler's bowling figures in a match is the sum of the wickets taken and the runs conceded over both innings. George Lohmann holds the record for the best Test career bowling average and strike rate, with figures of 10.75 and 34.1, respectively. A bowler's bowling average is the total number of runs they have conceded divided by the number of wickets they have taken. William Attewell finished his career with an economy rate of 1.31, a Test cricket record. Ian Botham took 27 five-wicket hauls during his Test career, a joint England record with James Anderson. A ten-wicket haul refers to a bowler taking ten or more wickets in a match over two innings. Sydney Barnes took 49 wickets in the 1913–14 series against South Africa, the most by any cricketer in a Test series. Matt Prior sits second behind Alan Knott for the most Test dismissals and catches taken by an England wicket-keeper. Alastair Cook, pictured in 2006, holds the record for the most matches as English captain, the most consecutive career matches in Test cricket and the most matches played for England with 59, 159 and 161 respectively. James Southerton is the fifth oldest cricketer to play in a Test match and was the oldest to make his debut. Wilfred Rhodes, pictured here aged 25, is the oldest cricketer to ever in play in a Test match at the age of 52. In cricket, two batsmen are always present at the crease batting together in a partnership. This partnership will continue until one of them is dismissed, retires or the innings comes to a close. A wicket partnership describes the number of runs scored before each wicket falls. The first wicket partnership is between the opening batsmen and continues until the first wicket falls. The second wicket partnership then commences between the not out batsman and the number three batsman. This partnership continues until the second wicket falls. The third wicket partnership then commences between the not out batsman and the new batsman. This continues down to the tenth wicket partnership. When the tenth wicket has fallen, there is no batsman left to partner so the innings is closed. Dickie Bird stood as an umpire in 66 matches, a former Test record, and is now the third most experienced English umpire behind David Shepherd and Ian Gould. An umpire in cricket is a person who officiates the match according to the Laws of Cricket . 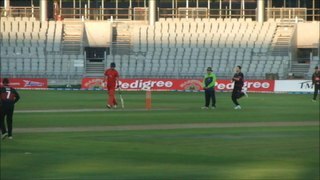 Two umpires adjudicate the match on the field, whilst a third umpire has access to video replays, and a fourth umpire looks after the match balls and other duties. The records below are only for on-field umpires. ↑ As of February 2019 [update] , a sixth batsman – Steve Smith – also averages over 60 in Test cricket and is still active. Adam Craig Gilchrist, AM, nicknamed "Gilly" or "Churchy", is an Australian cricket commentator and former international cricketer and former captain of Australia. He was an attacking left-handed batsman and record-breaking wicket-keeper, who redefined the role for the Australia national team through his aggressive batting. Widely regarded as the greatest wicket-keeper–batsman in the history of the game, Gilchrist held the world record for the most dismissals by a wicket-keeper in One Day International (ODI) cricket until it was surpassed by Kumar Sangakkara in 2015 and the most by an Australian in Test cricket. Shane Robert Watson is an Australian international cricketer who has played for Australia’s national cricket team and currently plays for Chennai Super Kings in the Indian Premier League and Quetta Gladiators in the Pakistan Super League respectively.Shane Watson captain of Australian team is a right-handed batsman and a right-handed fast-medium swing bowler. He debuted in 2002 in a One Day International and retired in 2016 as world No. 1 T20I all-rounder. He was the last player to retire from Australia's golden era of the early 2000s. Graeme Peter Swann is a former English cricketer who played all three formats of the game. Born in Northampton, he attended Sponne School in Towcester, Northamptonshire. He was primarily a right-arm offspinner, and also a capable late-order batsman with four first-class centuries, and often fielded at second slip. After initially playing for his home county Northamptonshire, for whom he made his debut in 1997, he moved to Nottinghamshire in 2005. Steven Peter Devereux Smith is an Australian international cricketer and former captain of the Australian national team. On 30 December 2017, he reached a Test batting rating of 947, the second-highest of all time, only behind Don Bradman's 961. He was ranked top Test batsman in the world in 2015, 2016 and 2017, according to the ICC Player Rankings. Smith is often regarded as one of the best batsmen in the world and considered the "best since Bradman" due to his high batting average. He played for New South Wales and Sydney Sixers in domestic cricket. Joseph Edward Root is an English international cricketer who is the current captain of the England Test team. He also represents Yorkshire domestically. He is often regarded as one of the best batsmen in the world. He now predominantly fields at first slip. He is currently ranked fourth in Test batting and fourth in ODI batting rankings according to the ICC Player Rankings, having previously been ranked the best Test batsman. Nathan Michael Lyon is an Australian international cricketer. He made his Test debut in 2011 and plays domestic cricket for New South Wales. Lyon is a Off-spin bowler and a lower-order right-handed batsman. As of March 2019, Lyon is the 18th-ranked Test bowler and 21st-ranked Test all-rounder in the world, according to the ICC Player Rankings. Considered the most successful off-spin bowler for Australia, Lyon holds the record for the most Test wickets taken by an Australian off-spin bowler, passing Hugh Trumble's 141 wickets in 2015. Bhuvneshwar Kumar Mavi is an Indian international cricketer who plays all formats of the game. He plays for Uttar Pradesh in domestic cricket and for Sunrisers Hyderabad in the Indian Premier League. Kumar is a right-arm medium-fast bowler who swings the ball both ways efficiently, with his inswingers more effective than outswing, especially adept at creating late swing, and a useful lower order right-handed batsman. Peter Stephen Patrick Handscomb is an Australian cricketer contracted domestically to Victoria and the Melbourne Stars. Handscomb is in the current squad for Tests, Twenty20 Internationals and One Day Internationals for Australia. He is a middle order batsman and occasional wicket-keeper. He initially had the role of wicket keeper for the national team when former keeper Matthew Wade was unavailable. He most recently kept during the First T20I against India in February 2019, replacing vice-captain Alex Carey in the lineup. The 2017–18 Ashes series was a series of Test cricket matches contested between England and Australia for The Ashes. The series was played at five venues across Australia between 23 November 2017 and 8 January 2018. England were the defending holders of the Ashes going into the series, having won in 2015. Australia won the series 4–0, regaining The Ashes after taking an unassailable lead with an innings victory in the third Test. Following revelations that Australian players cheated by ball tampering in their series against South Africa in March 2018, questions were raised regarding fair play in the Ashes series. Samuel Matthew Curran is an English cricketer, who plays for Surrey and England. Curran is a left-handed batsman and left-arm medium-fast bowler. The International Cricket Council (ICC) named Curran as one of the five breakout stars in men's cricket in 2018, and the 2019 edition of Wisden Cricketers' Almanack chose him as one of their five Cricketers of the Year. He is the youngest bowler to take a hat-trick in an Indian Premier League (IPL) match, at the age of 20. ↑ Nicholson, Matthew (2007). Sport and the Media: Managing the Nexus. Elsevier. p. 58. ISBN 978-0-7506-8109-4 . Retrieved 30 July 2018. ↑ Nicholas, Mark (15 March 2017). "Where are we 140 years later?". ESPNcricinfo. Archived from the original on 29 November 2017. Retrieved 30 July 2018. ↑ Williamson, Martin (22 August 2015). "The Oval grind of 1938". ESPNcricinfo. Archived from the original on 9 August 2017. Retrieved 30 July 2018. ↑ Gollapudi, Nagraj; Samiuddin, Osman (14 October 2017). "South Africa to play Zimbabwe in inaugural four-day Test". ESPNcricinfo. Archived from the original on 22 May 2018. Retrieved 30 July 2018. ↑ Williamson, Martin (18 May 2007). "International Cricket Council: A brief history ..." ESPNcricinfo. Archived from the original on 9 August 2017. Retrieved 30 July 2018. ↑ "ICC Classification of Official Cricket" (pdf). International Cricket Council. 1 October 2017: 2. Archived (PDF) from the original on 18 November 2017. Retrieved 30 July 2018. ↑ Williamson, Martin (23 January 1998). "The birth of Test cricket". ESPNcricinfo. Archived from the original on 27 October 2017. Retrieved 30 July 2018. 1 2 3 4 5 "Overall results summary for Test matches". ESPNcricinfo. Archived from the original on 3 February 2019. Retrieved 3 February 2019. 1 2 "Test records – Most career runs". ESPNcricinfo. Archived from the original on 9 October 2018. Retrieved 13 October 2018. 1 2 "English Test records – Most half-centuries". ESPNcricinfo. Archived from the original on 13 October 2018. Retrieved 13 October 2018. 1 2 "English Test records – Most centuries". ESPNcricinfo. Archived from the original on 13 October 2018. Retrieved 13 October 2018. 1 2 "English Test records – Most career catches by a non wicket-keeper". ESPNcricinfo. Archived from the original on 13 October 2018. Retrieved 13 October 2018. 1 2 "English Test records – Most catches in an series by a non wicket-keeper". ESPNcricinfo. Archived from the original on 13 October 2018. Retrieved 13 October 2018. 1 2 3 "English Test records – Most matches as captain". ESPNcricinfo. Archived from the original on 17 August 2017. Retrieved 30 July 2018. 1 2 3 4 "Test records – Most consecutive career matches". ESPNcricinfo. Archived from the original on 13 October 2018. Retrieved 13 October 2018. 1 2 3 "English Test records – Most career matches". ESPNcricinfo. Archived from the original on 3 February 2019. Retrieved 13 February 2019. 1 2 "English Test records – Most career wickets". ESPNcricinfo. Archived from the original on 3 February 2019. Retrieved 13 February 2019. 1 2 3 "Test records – Most career wickets taken by a fast bowler". ESPNcricinfo. Retrieved 13 October 2018. 1 2 3 "English Test records – Most five-wicket hauls in an innings". ESPNcricinfo. Archived from the original on 3 February 2019. Retrieved 13 February 2019. 1 2 "English Test records – Most ten-wicket hauls in a match". ESPNcricinfo. Archived from the original on 19 August 2017. Retrieved 30 July 2018. 1 2 3 "Test records – Most wickets in a series". ESPNcricinfo. Archived from the original on 6 September 2017. Retrieved 30 July 2018. 1 2 3 4 "English Test records – Most wicket-keeper career dismissals". ESPNcricinfo. Archived from the original on 17 August 2017. Retrieved 30 July 2018. 1 2 3 4 "Test records – Oldest players on debut". ESPNcricinfo. Archived from the original on 15 October 2017. Retrieved 30 July 2018. 1 2 3 4 5 "Test records – Oldest players". ESPNcricinfo. Archived from the original on 18 May 2017. Retrieved 30 July 2018. 1 2 "England Test records – Results summary". ESPNcricinfo. Archived from the original on 3 February 2019. Retrieved 3 February 2019. ↑ "Afghanistan drubbing WORST ever on Test debut". Sport24. 15 June 2018. Archived from the original on 13 October 2018. Retrieved 13 October 2018. ↑ "England Test matches against Australia". ESPNcricinfo. Archived from the original on 19 May 2018. Retrieved 30 July 2018. ↑ "England Test matches against Bangladesh". ESPNcricinfo. Archived from the original on 29 June 2017. Retrieved 30 July 2018. ↑ "England Test matches against India". ESPNcricinfo. Archived from the original on 19 May 2018. Retrieved 30 July 2018. ↑ "England Test matches against New Zealand". ESPNcricinfo. Archived from the original on 19 May 2018. Retrieved 30 July 2018. ↑ "England Test matches against Pakistan". ESPNcricinfo. Archived from the original on 19 May 2018. Retrieved 30 July 2018. ↑ "England Test matches against South Africa". ESPNcricinfo. Archived from the original on 19 May 2018. Retrieved 30 July 2018. ↑ "England Test matches against Sri Lanka". ESPNcricinfo. Archived from the original on 19 May 2018. Retrieved 30 July 2018. ↑ "England Test matches against the West Indies". ESPNcricinfo. Archived from the original on 19 May 2018. Retrieved 3 February 2019. ↑ "England Test matches against Zimbabwe". ESPNcricinfo. Archived from the original on 19 May 2018. Retrieved 30 July 2018. ↑ "Test records – Highest innings totals". ESPNcricinfo. Archived from the original on 4 January 2018. Retrieved 30 July 2018. ↑ "English Test records – Highest innings totals". ESPNcricinfo. Archived from the original on 17 August 2017. Retrieved 30 July 2018. ↑ "26 all out". ESPNcricinfo. Archived from the original on 30 August 2017. Retrieved 30 July 2018. ↑ "Test records – Lowest innings totals". ESPNcricinfo. Archived from the original on 4 January 2018. Retrieved 30 July 2018. ↑ Cameron, R. J., ed. (1983). "The Australian Flag". Year Book Australia. 67. Canberra: Australian Bureau of Statistics. pp. 23–24. ↑ "English Test records – Lowest innings totals". ESPNcricinfo. Archived from the original on 19 August 2017. Retrieved 30 July 2018. ↑ "5th Test, Australia tour of England at London, Aug 20-24 1938". ESPNcricinfo. Archived from the original on 20 May 2018. Retrieved 30 July 2018. 1 2 3 "Test records – Largest margin of victory (by an innings)". ESPNcricinfo. Archived from the original on 4 January 2018. Retrieved 30 July 2018. ↑ "Law 16 – The Result". Marylebone Cricket Club. Archived from the original on 29 December 2018. Retrieved 29 December 2018. 1 2 3 4 "English Test records – Largest victories". ESPNcricinfo. Archived from the original on 31 August 2017. Retrieved 30 July 2018. 1 2 "Test records – Largest margin of victory (by runs)". ESPNcricinfo. Archived from the original on 4 January 2018. Retrieved 30 July 2018. ↑ "Australian Test records – Largest victories". ESPNcricinfo. Archived from the original on 3 February 2019. Retrieved 3 February 2019. ↑ "West Indies Test records – Largest victories". ESPNcricinfo. Archived from the original on 3 February 2019. Retrieved 3 February 2019. ↑ "Pakistan Test records – Largest victories". ESPNcricinfo. Archived from the original on 3 February 2019. Retrieved 3 February 2019. ↑ "India Test records – Largest victories". ESPNcricinfo. Archived from the original on 3 February 2019. Retrieved 3 February 2019. ↑ "South Africa Test records – Largest victories". ESPNcricinfo. Archived from the original on 3 February 2019. Retrieved 3 February 2019. ↑ "Sri Lanka Test records – Largest victories". ESPNcricinfo. Archived from the original on 3 February 2019. Retrieved 3 February 2019. ↑ "New Zealand Test records – Largest victories". ESPNcricinfo. Archived from the original on 3 February 2019. Retrieved 3 February 2019. 1 2 "2nd Test, Australia tour of England and Scotland at Birmingham, Aug 4-7 2005". ESPNcricinfo. Archived from the original on 10 December 2017. Retrieved 30 July 2018. ↑ Thompson, Jenny (7 August 2005). "England hold nerve in two-run thriller". ESPNcricinfo. Archived from the original on 28 May 2018. Retrieved 30 July 2018. 1 2 "Test records – Smallest margin of victory (by runs)". ESPNcricinfo. Archived from the original on 7 August 2017. Retrieved 30 July 2018. 1 2 3 "English Test records – Smallest victories". ESPNcricinfo. Archived from the original on 7 October 2017. Retrieved 30 July 2018. ↑ "4th Test, Australia tour of England at Manchester, Jul 24-26 1902". ESPNcricinfo. Archived from the original on 3 December 2017. Retrieved 30 July 2018. ↑ "5th Test, Australia tour of England at London, Aug 11-13 1902". ESPNcricinfo. Archived from the original on 3 December 2017. Retrieved 30 July 2018. 1 2 3 4 "English Test records – Smallest defeats". ESPNcricinfo. Archived from the original on 20 May 2018. Retrieved 30 July 2018. 1 2 "Test records – Smallest margin of victory (by wickets)". ESPNcricinfo. Archived from the original on 31 August 2017. Retrieved 30 July 2018. ↑ Williamson, Martin (27 November 2010). "'A fine ****ing way to start a series'". ESPNcricinfo. Archived from the original on 29 July 2018. Retrieved 30 July 2018. ↑ "Test in Australia between 1936 and 1947". ESPNcricinfo. Archived from the original on 29 July 2018. Retrieved 30 July 2018. 1 2 3 4 "English Test records – Largest defeats". ESPNcricinfo. Archived from the original on 3 February 2019. Retrieved 3 February 2019. ↑ "Bangladesh Test records – Largest defeats". ESPNcricinfo. Archived from the original on 3 February 2019. Retrieved 3 February 2019. ↑ "Sri Lanka Test records – Largest defeats". ESPNcricinfo. Archived from the original on 3 February 2019. Retrieved 3 February 2019. ↑ "Zimbabwe Test records – Largest defeats". ESPNcricinfo. Archived from the original on 3 February 2019. Retrieved 3 February 2019. ↑ "Pakistan Test records – Largest defeats". ESPNcricinfo. Archived from the original on 3 February 2019. Retrieved 3 February 2019. ↑ "Australian Test records – Largest defeats". ESPNcricinfo. Archived from the original on 3 February 2019. Retrieved 3 February 2019. ↑ "South Africa Test records – Largest defeats". ESPNcricinfo. Archived from the original on 3 February 2019. Retrieved 3 February 2019. ↑ "New Zealand Test records – Largest defeats". ESPNcricinfo. Archived from the original on 3 February 2019. Retrieved 3 February 2019. ↑ "West Indies Test records – Largest defeats". ESPNcricinfo. Archived from the original on 3 February 2019. Retrieved 3 February 2019. ↑ "India Test records – Largest defeats". ESPNcricinfo. Archived from the original on 3 February 2019. Retrieved 3 February 2019. ↑ "1st Test, England tour of South Africa at Johannesburg, Jan 2-4 1906". ESPNcricinfo. Archived from the original on 1 January 2018. Retrieved 30 July 2018. ↑ "4th Test, Australia tour of England at Manchester, Jul 24-26 1902". ESPNcricinfo. Archived from the original on 2 January 2018. Retrieved 30 July 2018. ↑ "Fourth Test match – England v Australia 1902". Wisden Cricketers' Almanack . 1903. Archived from the original on 22 July 2017. Retrieved 30 July 2018– via ESPNcricinfo. ↑ Brownell, Frederick Gordon (2011). "Flagging the "new" South Africa, 1910–2010". Historia. 56 (1): 42–62. ISSN 2309-8392. 1 2 "English Test records – Most career runs". ESPNcricinfo. Archived from the original on 13 October 2018. Retrieved 13 October 2018. ↑ "Law 18 – Scoring runs". Marylebone Cricket Club. Archived from the original on 29 December 2018. Retrieved 29 December 2018. ↑ McConnell, Lynn (10 October 2003). "Hayden leaves Lara in his wake". ESPNcricinfo. Archived from the original on 19 April 2017. Retrieved 30 July 2018. ↑ Miller, Andrew (12 April 2004). "England in strife after Lara's 400". ESPNcricinfo. Archived from the original on 1 June 2017. Retrieved 30 July 2018. ↑ "Test records – Highest individual score". ESPNcricinfo. Archived from the original on 16 November 2017. Retrieved 30 July 2018. ↑ "Test records – Highest individual score (progressive record holder)". ESPNcricinfo. Archived from the original on 17 November 2017. Retrieved 30 July 2018. ↑ "English Test records – Highest individual score". ESPNcricinfo. Archived from the original on 19 August 2017. Retrieved 30 July 2018. 1 2 "English Test records – Highest career average". ESPNcricinfo. Archived from the original on 16 November 2017. Retrieved 30 July 2018. ↑ Pervez, M. A. (2001). A Dictionary of Cricket. Sangam Books. p. 7. ISBN 978-81-7370-184-9. ↑ "Sir Donald Bradman player profile". ESPNcricinfo. Archived from the original on 25 November 2017. Retrieved 30 July 2018. Sir Donald Bradman of Australia was, beyond any argument, the greatest batsman who ever lived and the greatest cricketer of the 20th century. Only WG Grace, in the formative years of the game, even remotely matched his status as a player. ↑ "Test records – Highest career average". ESPNcricinfo. Archived from the original on 9 June 2017. Retrieved 30 July 2018. ↑ "Test records – Most half-centuries". ESPNcricinfo. Archived from the original on 13 October 2018. Retrieved 13 October 2018. ↑ "Test records – Most centuries". ESPNcricinfo. Archived from the original on 13 October 2018. Retrieved 13 October 2018. 1 2 3 "Test records – Most double centuries". ESPNcricinfo. Archived from the original on 13 October 2018. Retrieved 13 October 2018. 1 2 "Test records – Most runs in a series". ESPNcricinfo. Archived from the original on 18 August 2017. Retrieved 30 July 2018. ↑ "Profile of Dennis Amiss". ESPNcricinfo. Archived from the original on 25 December 2017. Retrieved 30 July 2018. ↑ "Profile of Denis Compton". ESPNcricinfo. Archived from the original on 23 December 2017. Retrieved 30 July 2018. ↑ "Profile of Graham Gooch". ESPNcricinfo. Archived from the original on 16 June 2018. Retrieved 30 July 2018. ↑ "Profile of David Gower". ESPNcricinfo. Archived from the original on 6 June 2018. Retrieved 30 July 2018. ↑ "Profile of Eddie Paynter". ESPNcricinfo. Archived from the original on 10 November 2017. Retrieved 30 July 2018. ↑ "Profile of Joe Root". ESPNcricinfo. Archived from the original on 3 February 2019. Retrieved 3 February 2019. ↑ "Profile of Jonathan Trott". ESPNcricinfo. Archived from the original on 13 June 2018. Retrieved 30 July 2018. ↑ "English Test records – Most double centuries". ESPNcricinfo. Archived from the original on 13 October 2018. Retrieved 13 February 2019. 1 2 "Test records – Most triple centuries". ESPNcricinfo. Archived from the original on 30 December 2018. Retrieved 30 December 2018. ↑ Johnson, Martin (27 July 1990). "Action Replay; The day when Gooch joined the greats". The Independent . Archived from the original on 29 November 2014. Retrieved 30 December 2018. ↑ "English Test records – Most runs in a series". ESPNcricinfo. Archived from the original on 17 August 2017. Retrieved 30 July 2018. 1 2 3 Williamson, Martin. "A glossary of cricket terms". ESPNcricinfo. Archived from the original on 20 July 2017. Retrieved 30 July 2018. ↑ "Test records – Most ducks". ESPNcricinfo. Archived from the original on 3 February 2019. Retrieved 3 February 2019. ↑ "English Test records – Most ducks". ESPNcricinfo. Archived from the original on 3 February 2019. Retrieved 3 February 2019. 1 2 "Test records – Most career wickets". ESPNcricinfo.